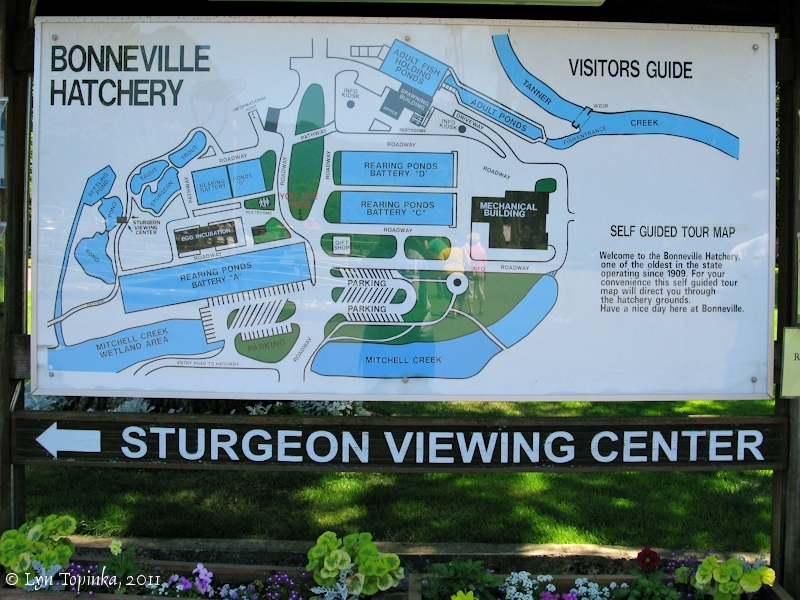 "Bonneville Fish Hatchery and Sturgeon Center, Oregon"
Click image to enlarge Sturgeon, Bonneville Fish Hatchery. Image taken June 19, 2005. The Bonneville Fish Hatchery and Sturgeon Center is located in Oregon is located on the downstream (west) side of the Bonneville Dam complex at Bonneville, Oregon, and uses the waters of Tanner Creek. 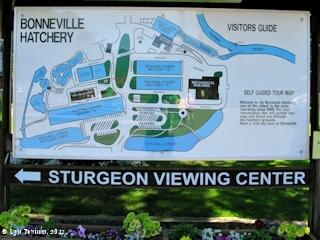 Click image to enlarge Map, Bonneville Fish Hatchery, Bonneville Dam, Oregon. Image taken July 1, 2011. 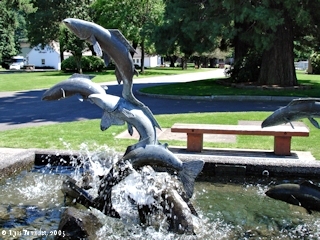 Lewis and Clark camped on the upstream side of Tanner Creek on November 9, 1806, today the location of the Bonneville Fish Hatchery. Tanner Creek and nine hatchery wells provide water for rearing fall chinook salmon, coho salmon, and summer and winter steelhead. Wahclella Falls, not quite a mile above the creek's mouth prevents fish passage beyond that point. 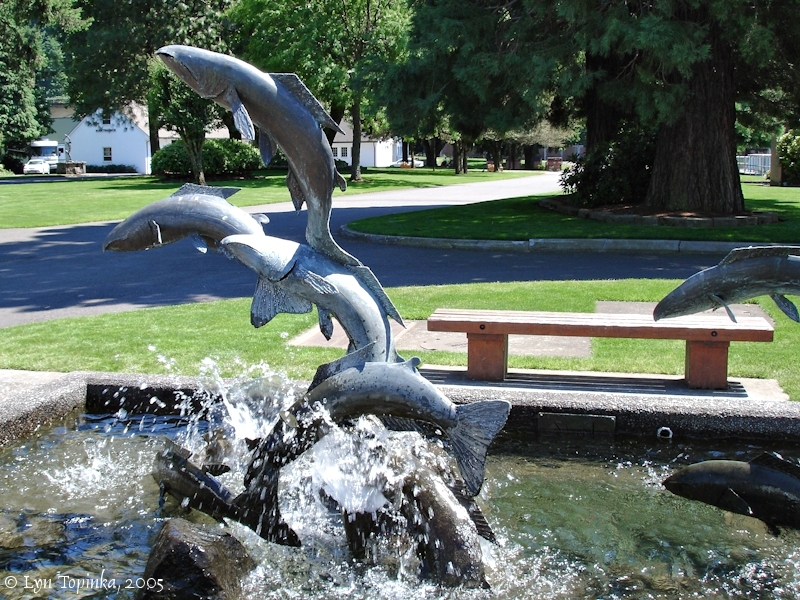 The Bonneville Fish Hatchery is managed by the Oregon Department of Fish and Wildlife and raises salmon and steelhead for sport, commercial and tribal fisheries in the lower Columbia River and along the northern Oregon Coast. 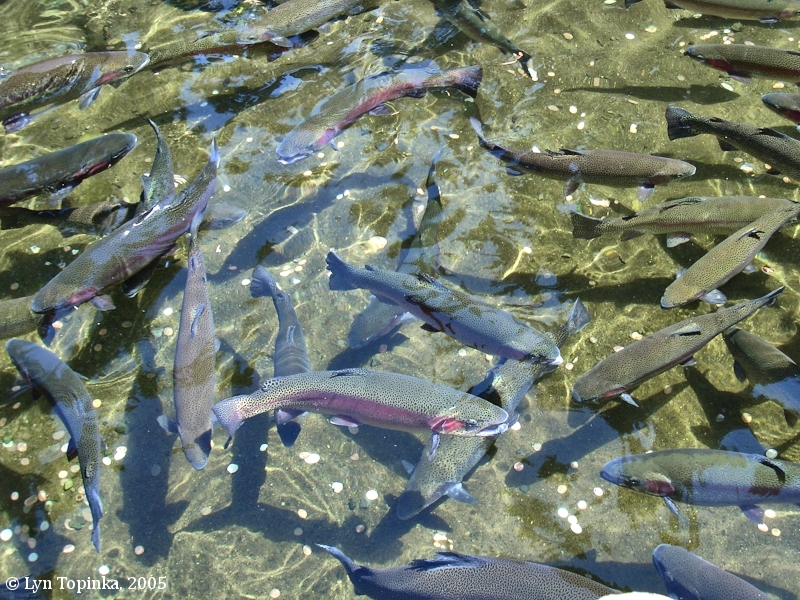 The Hatchery is one of the oldest fish hatcheries in Oregon and the largest in terms of fish production. The facility opened in 1909 and was known as the "Central Hatchery", so-called because it served as a central hatching and rearing site for eggs taken at other hatcheries. 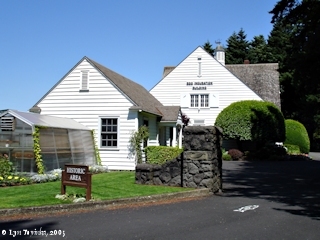 The hatchery was expanded in the 1930s, again in the 1950s, and again in the 1970s. In 1998 the hatchery added a specialized rearing building (closed to the public) to house the Grande Ronde Basin captive broodstock program for spring chinook, a threatened species. Today's Bonneville Fish Hatchery was built in conjunction with the construction of the Bonneville Dam. 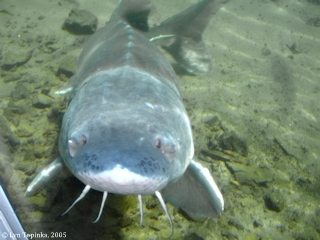 It's mission was to supplement the natural production of anadromous fish in the Columbia River watershed. 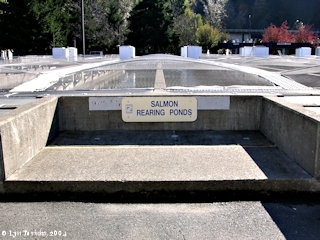 In 1997 the Hatchery was added to the National Register of Historic Places (District #86003598) as part of the Bonneville Dam Historic District. 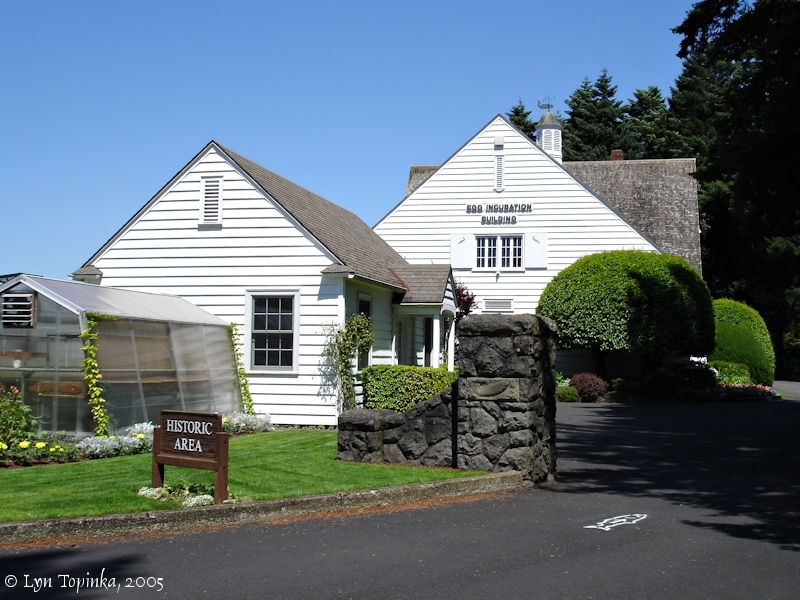 The Historic District was added to the National Register in 1986 and included the area of the Bonneville Dam (District #86000727). The original Fish Hatchery at Bonneville was constructed in 1909. With construction of the Bonneville Dam in the 1930s the Fish Hatchery itself had major renovations, realignment, and construction. Of the original rearing ponds only the three farthest to the northeast were retained and were rebuilt as new display ponds. 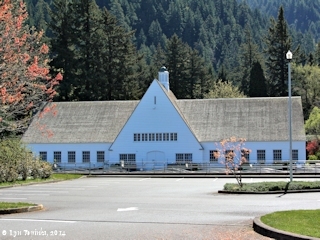 The Bonneville Hatchery's Incubation Building was built in 1936. Behind the building are located display ponds and an associated "settling pond". The display ponds were reconfigured out of part of the original early 1900s rearing ponds. The ponds are surrounded with rocks and plants indigenous to the Columbia Gorge. New kiosks which supply fish food for sale to visitors are in this area. 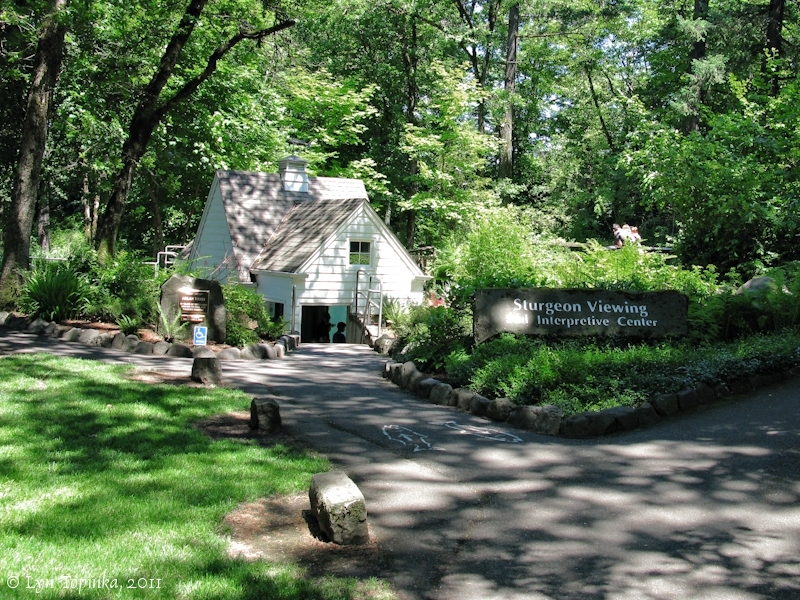 The "Sturgeon Viewing Center" is located in this area and features a 70-year-old Sturgeon named "Herman". In front of the Incubation Building are 22 concrete rearing ponds which were constructed in the 1930s. Each pond has a capacity of 300,000 fingerlings. In 1957 the facility was remodeled and expanded as part of the Columbia River Fisheries Development Program (Mitchell Act). 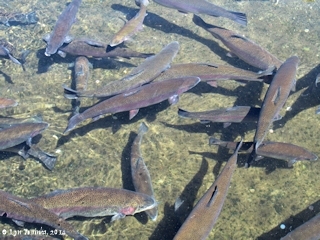 The hatchery underwent another renovation in 1974 as part of the U.S. Army Corps of Engineer's mitigation of fish losses from the construction of the John Day Dam. 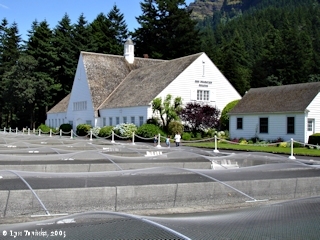 In 1997 the Hatchery was added to the National Register of Historic Places (District #86003598) as part of the Bonneville Dam Historic District. 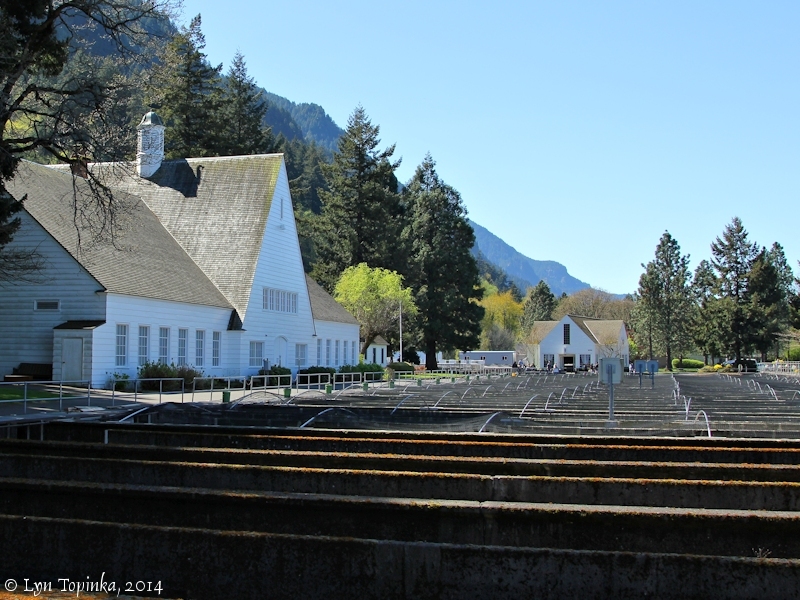 Click image to enlarge Bonneville Fish Hatchery buildings and pens, Bonneville Dam, Oregon. Image taken April 13, 2014. Click image to enlarge Bonneville Fish Hatchery, Bonneville Dam, Oregon. Image taken June 29, 2005. 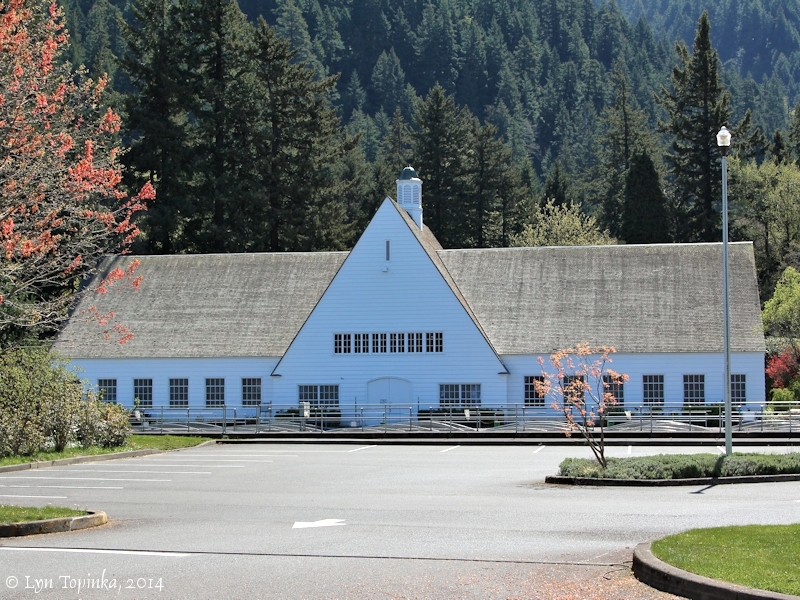 Click image to enlarge "Historic Area", Egg Incubation Building, Bonneville Fish Hatchery, Bonneville Dam, Oregon. Image taken June 29, 2005. 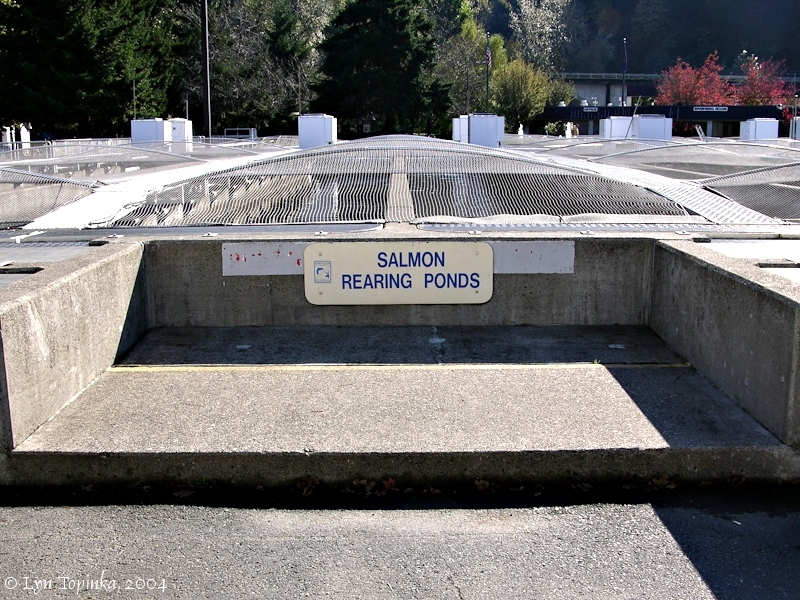 Click image to enlarge Salmon Rearing Ponds, Bonneville Fish Hatchery, Bonneville Dam, Oregon. Image taken October 27, 2004. 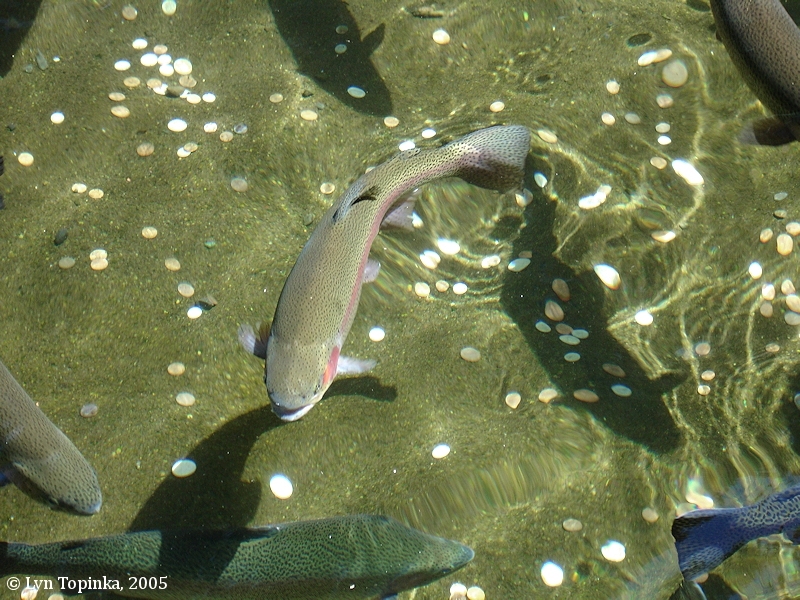 Click image to enlarge Rainbow Trout, Sturgeon Viewing Center, Bonneville Fish Hatchery, Bonneville Dam, Oregon. Image taken June 19, 2005. Tanner Creek Decided On by Master Fish Warden as Location of New Station. "Tanner Creek, near Bonneville, has been selected as the site for the central hatchery, for which the last Legislature made an appropriation of $20,000. Plans have been approved and bids asked for constructing at that point a building 55x230 feet, suitable for hatchery work. The new central station will be completed in time to receive the eyed eggs from the substations this Fall. ... Each stream was given due consideration, and Tanner Creek, at Bonneville, selected, due to its superior water quality and quantity." Source: Morning Oregonian, July 8, 1909, courtesy Historic Oregon Newspapers Archives, University of Oregon Libraries, 2016. 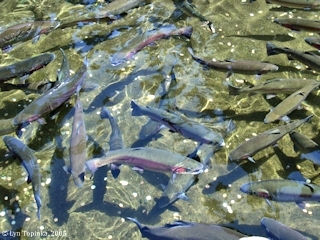 BONNEVILLE TURNS OUT MILLIONS OF YOUNG SALMON. 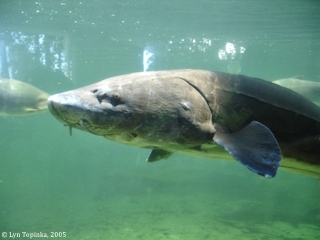 Governor to Help Dedicate Largest Artificial Spawning Grounds in World Next Monday. "SALEM, Or., Nov. 8 -- (SPecial.) -- Governor Benson, State Fish Warden McAllister, and other prominent Oregon men, as well as a number of leading men from the state of Washington, will take part next Monday, November 15, in th eceremonies incident to the opening of the Bonneville central fish hatchery. United States Fish Commissioner George M. Bowers has agreed to furnish to the State of Oregon each year for four successive years 2,000,000 eggs to aid in the experiment of transferring sockeye salmon from Alaska to the central hatchery at Bonneville. The Fish Warden is of the opinion that there is no reason why the Columbia cannot be stocked with this species of salmon." "Each year, Bonneville Hatchery raises 1.2 million coho, 8.5 million fall chinook, 215,000 summer steelhead and 60,000 winter steelhead. The coho are released into a pipeline that takes them to Tanner Creek and out into the Columbia River directly from the ponds. 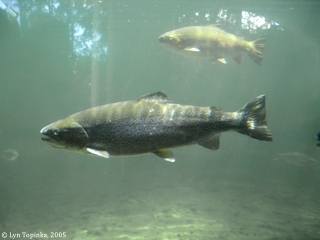 The fall chinook are split between Tanner Creek, the Umatilla River and Ringold Hatchery, which is located in the Hanford Reach on the Columbia River. 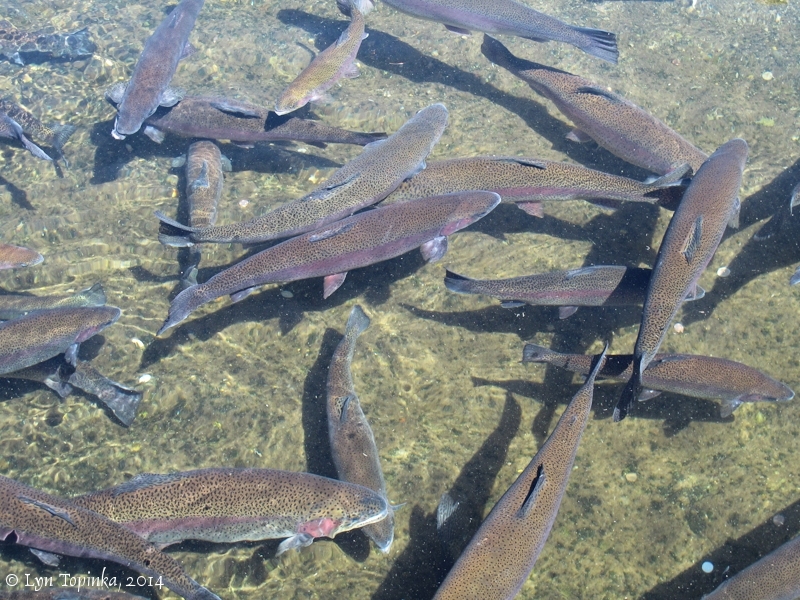 Bonneville Hatchery also rears fish for hatcheries in other river basins. Summer steelhead are spawned at South Santiam Hatchery and the eggs are transferred to Bonneville Hatchery. The eggs are incubated and reared in the outside ponds for one year. 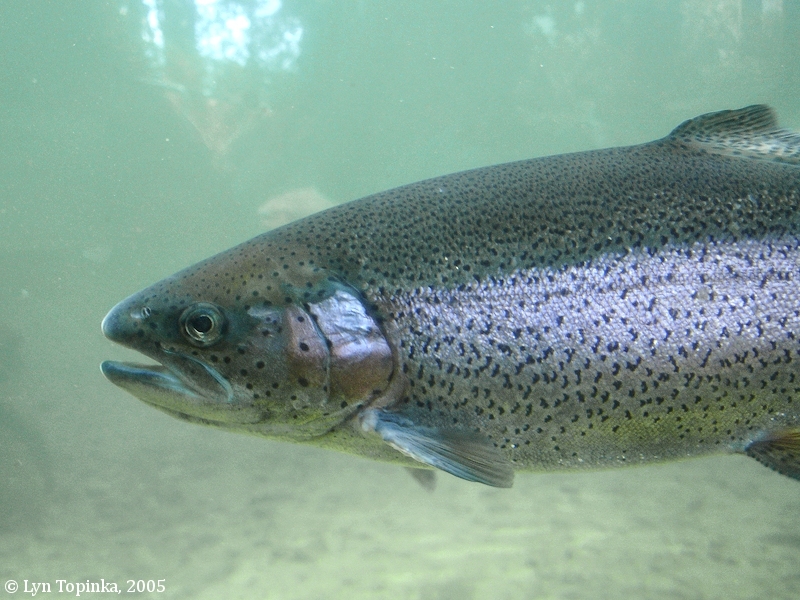 They then are transferred to Sandy and Clackamas hatcheries for acclimation and are released into each river. 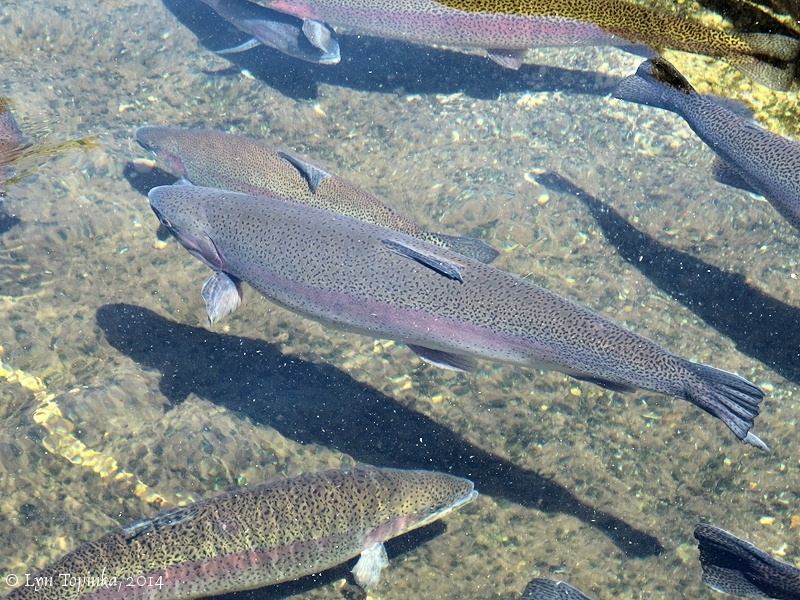 Winter steelhead are spawned at Sandy hatchery and the eggs are transported to Bonneville. The eggs then are incubated and reared for one year before being transported back to Sandy Hatchery for acclimation and release into the Sandy River." Source: Oregon Fish and Wildlife Brochure, "Bonneville Fish Hatchery", downloaded April 2014. Click image to enlarge Fountain, Bonneville Fish Hatchery, Bonneville Dam, Oregon. Image taken June 29, 2005. 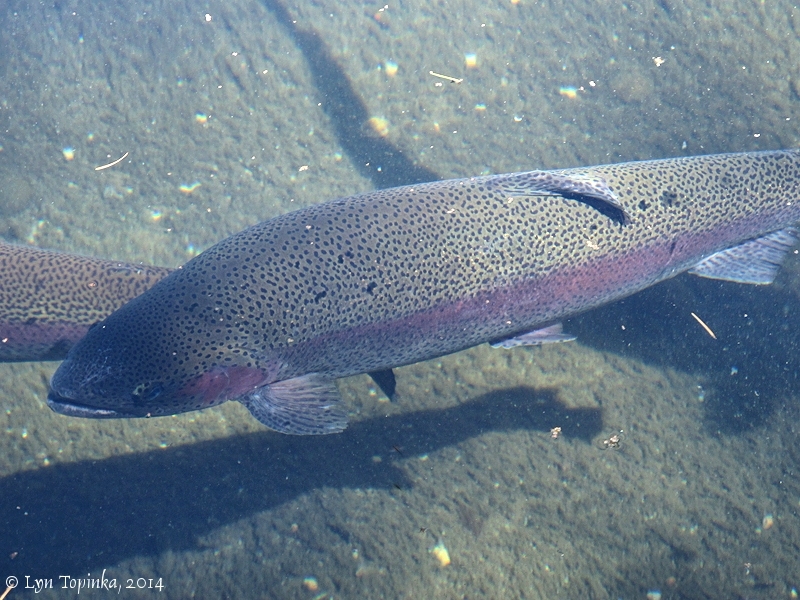 Click image to enlarge Rainbow Trout, Bonneville Fish Hatchery, Bonneville Dam, Oregon. Image taken April 13, 2014. Click image to enlarge Rainbow Trout, Bonneville Fish Hatchery, Bonneville Dam, Oregon. Image taken June 19, 2005. Click image to enlarge Young Sturgeon, Bonneville Fish Hatchery, Bonneville Dam, Oregon. Image taken June 19, 2005. 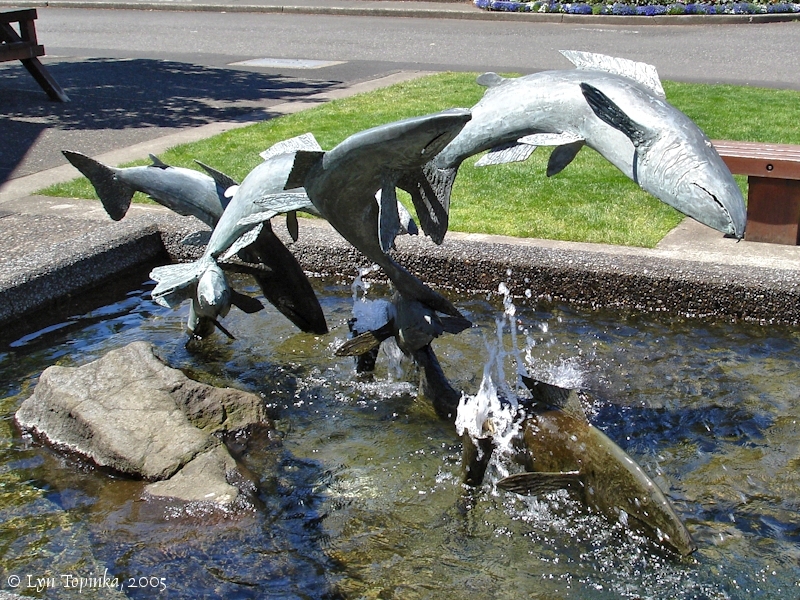 In 1998, the Oregon Wildlife Heritage Foundation along with the Oregon Department of Fish and Wildlife, built the Sturgeon Viewing and Interpretive Center at the Bonneville Fish Hatchery. 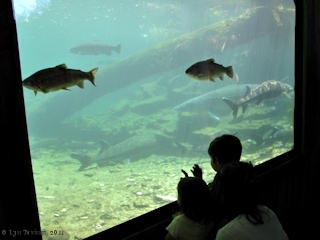 Visitors can view sturgeon and trout through an underwater window as they swim in a natural environment. 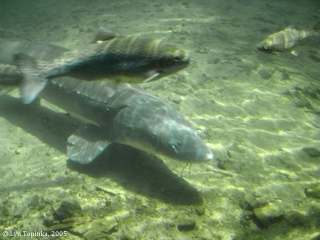 Click image to enlarge Sturgeon Viewing Center, Bonneville Fish Hatchery, Bonneville Dam, Oregon. Image taken July 1, 2011. Click image to enlarge Watching through the window, Sturgeon Viewing Center, Bonneville Fish Hatchery, Bonneville Dam, Oregon. Image taken July 1, 2011. Click image to enlarge Sturgeon and Trout, Sturgeon Viewing Center, Bonneville Fish Hatchery, Bonneville Dam, Oregon. Image taken June 19, 2005. 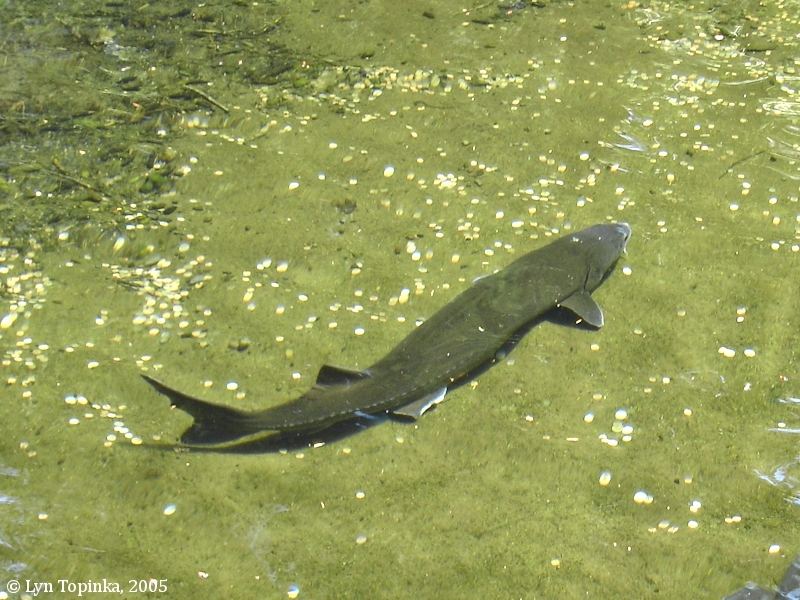 Click image to enlarge Sturgeon head, Sturgeon Viewing Center, Bonneville Fish Hatchery, Bonneville Dam, Oregon. Image taken June 19, 2005.